It is fundamental that my patients understand the science behind their treatments. There is too much “quasi science” in the aesthetic industry that is fooling the general public. As a result, many patients are dissatisfied with their outcomes and have buyer’s remorse. Perhaps the most controversial area of the industry is with “skin tightening” procedures. After reading this and my previous blog on the Infini, hopefully you will recognize the reasons why most of the devices/procedures for skin tightening don’t work well and why the Infini stands out from the crowd. To achieve skin tightening, the deeper layer of the skin, the dermis, needs to create new collagen. It has been found that heating this layer of skin can stimulate neocollagenesis (new collagen production). The threshold is 42 degrees centigrade to impart a stimulus to the dermis, because at this temperature collagen denaturing occurs (the bonds holding collagen together break down). The body senses the injury, and during the repair of this area, new, youthful collagen is produced. The response is very mild at these temperatures. At higher temperatures, 55-70 degrees centigrade, coagulation of the collagen and surrounding tissue occurs, with more coagulation seen in the higher range of those temperatures. WHEN COAGULATION OCCURS, THE BODY’S RESPONSE TO THE INJURY IS MUCH MORE INTENSE. TO ACHIEVE MAXIMUM SKIN TIGHTENING AND COLLAGEN FORMATION, COAGULATION IS NEEDED IN THE DERMIS. Digression: The long standing “gold standard” for wrinkle control and skin tightening (without surgery) has been considered the fully ablative CO2 laser. It has been determined that its efficacy is based primarily on its significant coagulation effect. The risks associated with complete removal of the upper layer of the dermis – prolonged healing, redness, scarring, infection, and hypo and hyperpigmentation – have significantly curtailed its use. Recent technology improvements that have made the CO2 laser fractional (treating only a fraction of the skin) has greatly reduced the risks, but they are still present. Erbium laser resurfacing, which traditional has very little coagulation, has not been shown to have the same results as the CO2 laser. Changes in the Erbium to give it more of a coagulation effect on the skin have lead to better results. The ideal skin tightening device would cause tissue coagulation in the dermis, but have very little of the risks and downtime associated with the CO2 laser. Radiofrequency devices have been trying for over 10 years to do this without success. They try to heat the dermis, but not the epidermis (upper layer of the skin) to the 42 degrees needed to get a mild neocollagenesis. THE PROBLEM IS THAT ALL THE NON PENETRATING RF DEVICES CAN DO, AT THEIR VERY BEST, IS HEAT, BUT NOT COAGULATE, TISSUE IN THE DERMIS. The needle depth is fixed and not variable. The facial skin has a huge variation in depth, from 0.38mm to 3mm. 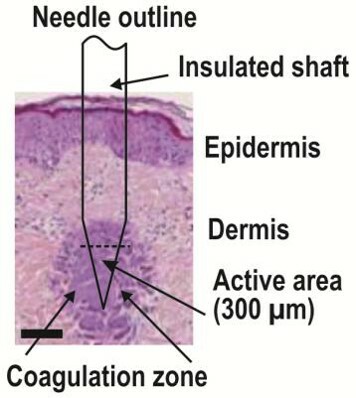 Ideally, the coagulation is placed at the deep dermal layer. If it is too deep, there will be minimal collagen response. The themal injury is not fractional. Treating fractionally is the way to treat in 2014. This allows for accelerated healing, minimal risks, without compromising results. Their temperatures don’t reach the level high enough for coagulation. Without coagulation, results won’t be as good. THE INFINI USES INSULATED NEEDLES, HAS VARIABLE NEEDLE DEPTH (0.5mm-3.5mm), AND CAUSES A FRACTIONAL COAGULATION INJURY IN THE DERMIS. Ulthera currently only has 3 depths – 1.5mm, 3mm and 4.5mm. For most of the face, only the 1.5 is at the level of the dermis. Ulthera reportedly tightens at the deeper muscular layer, the SMAS, but this has yet to be a proven mechanism by histological samples (looking under the microscope at biopsies). Much of the coagulation from Ulthera is in the subcutaneous fat or fat layer, an area that produces very little or no collagen. It does explain the improvement in the jawline and upper neck though, the areas where there are fatty deposits. Ulthera lays down about 15,000 thermal coagulation points (TPC’s) during a treatment. The Infini will create 50,000 or more of these TPC’s during a treatment. More TPC’s probably mean more results because Ulthera has proven that going from 7500 TPC’s to 15,000 TPC’s gave them better results. Ulthera is more expensive for the physician to use, so the costs get passed on to the patients. To summarize, skin tightening requires a coagulation injury in the deeper dermis. The discussion above has tried to show that besides the Infini, all other RF devices fail to deliver a predictable, safe, thermal injury to the point of coagulation in the dermis. Without the coagulation in the dermis, results will be unsatisfactory. In essence, the Infini has made Thermage, Venus Freeze, Exilis, Pelleve, Tripolar, Titan – all OBSOLETE. To get a better grasp of the RF skin tightening Industry, please read the blog: “FINALLY…A Radiofrequency (RF) Skin Tightening Device that Makes Sense. Infini by Lutronic.” Includes an overview of the RF skin tightening industry. No, Infini does not affect fat or filler if done at appropriate levels as to stay in the dermis. My fillers are injected below the dermis with cannulas. If filler is in dermis, it can possibly be affected. We will often inject fillers just before infini which helps in comfort too.